Reason #25 I want to leave Jacksonville, Florida. Last January I ran away from Jacksonville to join the circus in LA. Not the literal circus. The literary circus. Jacksonville is like hell without the luxury of sweating. The city provided me with great content for my soon-to-be released book, The Taste of Scars, however I’ve out grown it. I’ve been in LA and I need to book a ticket back home to clean out my apartment. My lease ends April 30. Where from there? When you’re unemployed the skies the limit, literally. I can sleep on any bench in any city. LA is a good distraction from Jacksonville. It’s more of a movie and TV script world. New York is the book world. Fire and Ink, the black lgbt literary conference, is hosting an event with a special reading by Staceyann Chin and Carl Hancock Rux. I would drop it like its hot for Hugh Hefner to get a plane ticket to New York and a ticket to the event, Writes of Spring. I would love to hear Staceyann perform. I might be sleeping on a New York bench at the end of the month. The video above is of Staceyann. 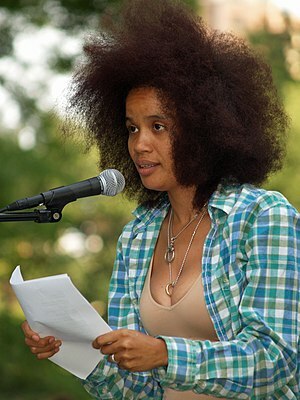 Staceyann is one of my favorite authors and poets. While editing a few chapters in LA I would listen to this performance on repeat at the Starbucks on Wilshire near LACMA (not LACAMA). I never watched Def Poets Jam and was excited to learn that Staceyann performed on the show and grinned like a proud daddy when on National TV, in front of a live audience, at black audience, on Def Poets Jam, Staceyann read a poem about her experience being a lesbian (To watch the video hit the more button below). If you’re in NYC please check out Staceyann Chin and Carl Hancock Rux at Writes of Spring. Description: Enjoy an evening of food, festivities, music and a special reading by the talented STACEYANN CHIN and CARL HANCOCK RUX! Unapologetically Caribbean and Black, Asian and lesbian, woman and New Yorker, STACEYANN CHIN is the author of the memoir, The Other Side of Paradise. CARL HANCOCK RUX, is an award-winning poet, playwright, novelist, essayist, recording artist, and author of Asphalt and Pagan Operetta. The event is hosted by Steven G. Fullwood and Reginald Harris. The cost is $25.00 per person. All proceeds benefit FIRE & INK, INC. Advance tickets available at Fireandink.org! FIRE & INK, INC. is devoted to increasing the understanding, visibility and awareness of the works for gay, lesbian, bisexual and transgender writers of African descent and heritage. Saturday, April 30, 2011, 7:00 PM – 11:00 PM. Address: 213 Taaffe Place #114 Brooklyn, NY.